Hannah Genders introduces one of her favourite projects – a garden to go with an eco-house. The process of creating a garden for a client, from design to the build and planting, can take a long time, especially if the client is doing a new eco-house. The landscape design, along with the architect’s drawings, need to go in for planning and then it can be a waiting game for months before we hear back. If planning is granted it is often with conditions, so alterations need to be made. Then the house has to be built before we start the garden build – all this can take months, even years, and during that time I have found I get to know the client really well. 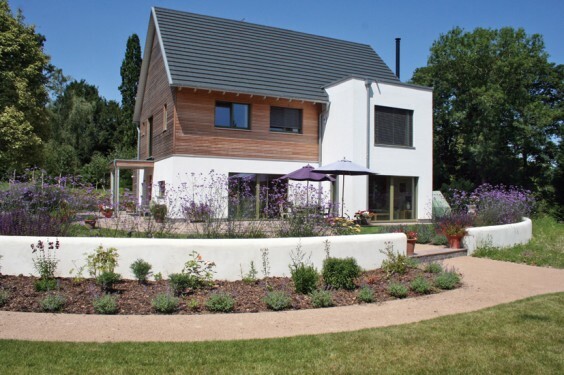 Last year we completed just such a project, a new eco-house and adjoining gardens in Hampshire. The client, Merula, was and still is one of my favourite clients and the garden we have built for her is one of my favourites too. I first met Merula in spring 2012 when she was living in a 17th-century priory. The house had been her family home for 30 years and she and her husband had planted the entire garden during this time, including some wonderful beech hedges which were now over ten feet tall. The garden was about four acres in total. Merula’ s husband had tragically been killed in a car accident a few years before I had met her, and while she wanted to stay in the area she didn’t want such a large house and garden to manage on her own. Having sought outline planning permission, the idea she had was to downsize into her own garden, taking one acre of land away from the priory and building an eco-house with a separate entrance. Once this was complete she would move across and sell the priory. She had chosen Baufritz, the German eco-house builders I work with closely, and this is how we met. The siting of the eco-house is crucial for solar gain (sunlight for warmth) and ideally needs to be as sheltered as possible. The perfect spot was an old tennis court, away from the priory and sectioned off by some of the large beech hedges. It also meant the house could be hunkered down in the landscape and so hardly overlooked by neighbours. So here was the challenge: to come up with a garden (within an existing garden) that was sensitive to the surrounding landscape and complemented the new eco-build. I also wanted to fully understand the key elements of Merula’s current garden and what was important to her, and then sensitively recreate a landscape that recognised the old but also pushed forward into a new space and a new phase of life. Merula and I instantly clicked, both in taste and an easy communication on what was needed; she is a very creative person and could easily understand plans and designs, and she is also a very keen gardener and was always actively involved in all the stages of the design process. The house and garden are now complete – the house is accessed by a separate entrance off the same lane as the priory, the brick and flint wall was rebuilt to match with the existing one, and a refurbished oak gate works really well. Merula is a keen vegetable grower, so we designed and built a low-maintenance vegetable plot just off the entrance and near the new garage. Pleached hornbeams screen this area to give some privacy but allow the lovely wall to be viewed underneath. A pedestrian entrance makes use of some existing pleached hornbeams with a path through them and down to the house. A sweeping gravel driveway takes you to the garage or a parking space near the entrance to the house. Wide, gracious steps lead to the front door and the patio sweeps right round the back of the house to allow plenty of space for sitting and entertaining outside. As well as growing food, Merula is very hospitable and an excellent cook – I can vouch for this as I have enjoyed many of her delicious lunches. A low, rendered wall the same colour as the house partially encloses the garden space while allowing views out to other areas of the garden. This is planted up with soft perennials, ornamental grasses and lavender in large drifts to add drama to the space. A wide path and step through the wall leads on to another seating area which captures the evening sun, and we planted some mature trees to further screen the priory above the height of the existing beech hedge. The bank on the far side of the house slopes down to a natural stream, and this was planted up as a wildflower meadow with seed and plug plants to get some colour in the first year. The stream is a very special area and this was enhanced with a curved deck over the water and a bench to sit and enjoy this secluded part of the garden. With the ongoing care I know Merula will give this garden, it will go from strength to strength. I’m really looking forward to going back this summer, seeing Merula again, enjoying one of those memorable lunches and going around the garden with her to see how it is maturing.